A Political Mystery for the Ages–Who is he???? This came from a union guy in Chicago who didn’t vote for Obama. Very interesting perspective that I never thought of in this light. It is circulating that, according to the U.S. Census, there is only one Barack Obama but 27 Social Security numbers and over 80 alias connected to him. Please continue sending this out. Somewhere, someone has to know SOMETHING!? !… School? Before he reorganized Chicago?… SOMETHING!!! He just seemed to burst upon the Scene at the 2004 Democratic Convention. ANYONE??? ANYWHERE??? ANYTHING??? Even more troubling is… Who Sent Him,,,? We understand far too little about Muslims leaving their homes. What is Hijrah? Obama is well educated in the Muslim religion since he studied it while living in Indonesia. He does not want this email to be spread all over the US because he wants us to be totally ignorant of what is really going on with the ISIL movement. All this turmoil now makes sense. Sad, and doesn’t bode well for us at all. So what is a Hijrah? Hijrah is when large scale mass migrations become invasions. What is happening in parts of Europe right now, actually appears to be a hijrah as the Quran describes it. This is NOT going to end well. Because it appears the policies of the liberal socialist leaders in Europe and the US do not want to keep their lands from being overrun. Why? I couldn’t figure out why other Arab countries (Saudi Arabia, UAE, Oman, etc.) weren’t taking in refugees, so I started digging. Hijrah is jihad by emigration. It means moving to a new land in order to bring Islam there and is considered in Islam to be a holy and revered action. “And whoever emigrates for the cause of Allah will find on the earth many locations and abundance, and whoever leaves his home as an emigrant to Allah and His Messenger and then death overtakes him, his reward has already become incumbent upon Allah.” Surah 4:100. So, if a Muslim dies in the process of immigrating to another country, that’s essentially the same as being a suicide bomber, his reward is automatic. This explains the great eagerness to undertake such a perilous journey. Muhammad and his followers emigrated from Mecca to Yathrib/Medina in 622 CE. It was there that he became a military leader though still uneducated. This is where all the commands to commit violence against unbelievers originated. It’s important to note that the Islamic calendar marks this as the beginning of Islam. This current massive hijrah was announced last January, although few Muslim countries paid the announcement much attention. A supporter (or member) of ISIS uploaded a document in Arabic that urged Muslims to get to Libya because of its proximity to southern Europe and for the important tactical value of its illegal immigration circuits to facilitate infiltration of European cities. Libya has a long coast and looks upon the southernmost countries of western European, which can be reached with ease by even a rudimentary boat. Also in February, the Turkish intelligence service warned police that up to 3,000 trained jihadists were seeking to cross into Turkey from Syria and Iraq and then travel through Bulgaria and Hungary into western Europe and then into the rest of Europe. Sound familiar? In May, a Libyan government adviser warned that Islamic State operatives were being” smuggled to Europe in migrant boats.”ISIS is profiting from the human trafficking trade, forcing boat owners to hand over their profits or be killed. Some ISIS operatives are already sheltered in safe houses in the south of the Europe. Groups of men, 17 to 25, from Palestine and Syria, cross into Bulgaria and from there move into the rest of the EU. A former Al Qaeda double agent told the BBC that he knew of two Egyptian brothers who reached Italy from Libya, accompanied by men who were deeply religious and fluent in Italian and French. Go watch the videos of those “refugees” again. How many of the “refugees” are 17-25 year old men and of military age? If that doesn’t convince you, we already know terrorists are coming through with the waves of refugees: a week ago five men were arrested attempting to cross the Bulgarian-Macedonian border with Islamic State propaganda, specific Jihadists prayers, and decapitation videos on their phones. They had been posing as refugees. UK Independence Party leader Nigel Farage warned: “I fear we face a direct threat to our civilization if we allow large numbers of people from that war torn region into Europe. Other Muslim countries are not “taking in” these “refugees” because this is a hijrah into Europe. This is no humanitarian crisis. It is an invasion. Its goal is to transform Europe: over tax its economies, tear down its wealthiest nations, re-draw the demographics and, of course, the culture. And our government wants to start letting them into our Country? Obama, having already announced over 100,000 are going to arrive in the USA in 2017. Are we all Forest Gumps? If you feel this is worth sharing with others, please copy and re-post, thanks. It appears that James Comey did not recommend federal charges against Hillary Clinton, in part because he is connected to the Clinton Foundation through the Swiss bank HSBC. According to Mini Planet ,a review of FBI Director James Comey’s professional history and relationships shows that the Obama cabinet leader — now under fire for his handling of the investigation of Hillary Clinton — is deeply entrenched in the big-money cronyism culture of Washington, D.C. His personal and professional relationships — all undisclosed as he announced the Bureau would not prosecute Clinton — reinforce bipartisan concerns that he may have politicized the criminal probe. These concerns focus on millions of dollars that Comey accepted from a Clinton Foundation defense contractor, Comey’s former membership on a Clinton Foundation corporate partner’s board, and his surprising financial relationship with his brother Peter Comey, who works at the law firm that does the Clinton Foundation’s taxes. When President Obama nominated Comey to become FBI director in 2013, Comey promised the United States Senate that he would recuse himself on all cases involving former employers. Comey served as deputy attorney general under John Ashcroft for two years of the Bush administration. When he left the Bush administration, he went directly to Lockheed Martin and became vice president, acting as a general counsel. How much money did James Comey make from Lockheed Martin in his last year with the company, which he left in 2010? More than $6 million in compensation. Lockheed Martin is a Clinton Foundation donor. The company admitted to becoming a Clinton Global Initiative member in 2010. According to records, Lockheed Martin is also a member of the American Chamber of Commerce in Egypt, which paid Bill Clinton $250,000 to deliver a speech in 2010. In 2010, Lockheed Martin won 17 approvals for private contracts from the Hillary Clinton State Department. In 2013, Comey became a board member, a director, and a Financial System Vulnerabilities Committee member of the London bank HSBC Holdings. “Mr. Comey’s appointment will be for an initial three-year term which, subject to re-election by shareholders, will expire at the conclusion of the 2016 Annual General Meeting,” according to HSBC company records. “Retrofitting” refers to a Green initiative to conserve energy in commercial housing units. Clinton Foundation records show that the Foundation projected “$1 billion in financing” for this Green initiative to conserve people’s energy in low-income housing units. When our source called the Chinatown offices of D.C. law firm DLA Piper and asked for “Peter Comey,” a receptionist immediately put him through to Comey’s direct line. But Peter Comey is not featured on the DLA Piper website. Peter Comey serves as “Senior Director of Real Estate Operations for the Americas” for DLA Piper. James Comey was not questioned about his relationship with Peter Comey in his confirmation hearing. DLA Piper is the firm that performed the independent audit of the Clinton Foundation in November during Clinton-World’s first big push to put the email scandal behind them. DLA Piper’s employees taken as a whole represent a major Hillary Clinton 2016 campaign donation bloc and Clinton Foundation donation base. DLA Piper ranks #5 on Hillary Clinton’s all-time career Top Contributors list, just ahead of Goldman Sachs. And here is another thing: Peter Comey has a mortgage on his house that is owned by his brother James Comey, the FBI director. Peter Comey’s financial records, obtained by Breitbart News, show that he bought a $950,000 house in Vienna, Virginia, in June 2008. He needed a $712,500 mortgage from First Savings Mortgage Corporation. But on January 31, 2011, James Comey and his wife stepped in to become Private Party lenders. They granted a mortgage on the house for $711,000. Financial records suggest that Peter Comey took out two such mortgages from his brother that day. This financial relationship between the Comey brothers began prior to James Comey’s nomination to become director of the FBI. DLA Piper did not answer any question as to whether James Comey and Peter Comey spoke at any point about this mortgage or anything else during the Clinton email investigation. Lead FBI agent John Giacalone abruptly resigned in the middle of the investigation in February 2016. FBI agents stunned that targets Cheryl Mills and Heather Samuelson were permitted to sit in on Hillary Clinton’s FBI interview. Clinton and aides cited amnesia. In Clinton’s case she claimed due to medical complications. “According to the Election Protection Coalition, voters all across America reported over 70,000 voting problems by five o’clock Eastern time on election day in 2012. In many instances, voters that were attempting to vote for Mitt Romney were having their votes switched to Barack Obama by the voting machines. We are going to look at some examples of this phenomenon below. In particular, we want to focus on the swing states, because that is where most of the voting irregularities seem to have popped up. If you are going to steal an election, you don’t really care too much about the really “red states” or the really “blue states”. Rather, the key would be to shift enough votes in the tightly contested swing states to ensure a victory for your candidate. And so let’s take a look at what happened in some of the most important swing states during the last election. During election night in 2012, the pundits breathlessly proclaimed that it was all going to come down to Ohio. They told us that if Mitt Romney was going to have any chance of winning the election that he had to win Ohio, and so that was the state to watch more than any other. One of the counties where Barack Obama really needed to run up votes was in Cuyahoga County. But Barack Obama didn’t just solidly win in Cuyahoga County. In fact, there were 16 precincts were Mitt Romney did not receive a single vote. There were also a whole host of precincts in Cuyahoga County where Mitt Romney received just one or two votes. Overall, Barack Obama won more than 99 percent of the vote in more than 100 precincts in just this one county. How in the world does that happen? “I don’t know if it happened to anybody else or not, but this is the first time in all the years that we voted that this has ever happened to me,” said Marion, Ohio, voter Joan Stevens. Stevens said that when she voted, it took her three tries before the machine accepted her choice to vote for Romney. “I went to vote and I got right in the middle of Romney’s name,” Stevens told Fox News, saying that she was certain to put her finger directly on her choice for the White House. So she pushed Romney again. Obama came up again. Then it happened a third time. “Maybe you make a mistake once, but not three times,” she told Fox News. At the time, Fox News also reported that similar things were happening in Nevada, North Carolina and Texas, but once election day faded from memory nobody really seemed to care about these incidents anymore. Pennsylvania is another very important swing state, and as the 2012 election approached the Romney campaign was actually somewhat optimistic that they may have a shot of winning the state. And it turned out that Mitt Romney did win 55 out of the 67 counties in Pennsylvania, but he still managed to lose the entire state by a significant margin because of the crazy vote totals that Obama ran up in the urban areas. If you can believe it, there were 59 voting divisions in the city of Philadelphia where Mitt Romney did not get one single vote. The combined vote total for those 59 voting divisions was 19,605 for Barack Obama and 0 for Mitt Romney. The odds of that happening by random chance are so low that they are not even worth mentioning. So how does something like that happen? Well, the overall voter turnout rate in the city of Philadelphia was approximately 60 percent on election day in 2012. But in the areas of the city where Republican poll watchers were illegally removed, the voter turnout rate was over 90 percent and Barack Obama received more than 99 percent of the vote. You would think that the Republican Party should have screamed bloody murder about this, but instead they did absolutely nothing. He said the changes appeared to have been made by a software program. Ashcroft said the format for computer programming has a default status, and in this case it appeared to be designating a vote for Obama each time it went to default. So would Mitt Romney have won the state of Pennsylvania if the voting had been fair? We may never know the answer to that question. How exactly did he accomplish this? Well, in part thanks to Broward County Precincts L024 to L029 (though I’m sure it’s all a coincidence that this happened to precincts all in order). In those precincts combined, all in order, Mr. Obama won over 99% of the vote, defeating Mitt Romney 5,392 to… 54. Golly, how lucky! This especially impressive because in precincts L019-L022 (L023 doesn’t exist) Mr. Romney did over 14 times better than in L024-L029, and the precinct after, did 30 times better. Most Americans have never even heard any of this information. And remember, in this article we are looking at just a few examples from the most critical swing states. The truth is that these kinds of “statistical anomalies” were happening all over the nation. -That it appeared that voters for Obama were being bussed in. -That many of them could not speak English at all. -That many of them could not even tell poll workers the correct address on their identification cards. -That many people were voting more than once at that same polling station throughout the day. It appears that funny business was happening in swing states out west as well. Somehow, 10 counties in the key swing state of Colorado had a voter registration rate of more than 100 percent on election day in 2012. Theoretically this is impossible. If all of the voting age people in your county registered to vote you could have a voter registration rate of 100 percent, but to go beyond that means that something is seriously wrong. And yesterday I did show that authorities in Colorado have discovered that there is a “very serious” pattern of dead people casting votes in the state that goes back for many years. This is why states should be allowed to require photo identification at voting locations. The integrity of our voting process has been compromised over and over again, and anyone that tries to steal an election is committing a crime against all of us. It is a fact that Barack Obama did not win in a single state that required a photo I.D. to vote in 2012. So what would the election results have looked like if all 50 states had required a photo I.D. to vote? We can’t go back and change what happened in 2012, but we sure can do something about 2016. If you see something strange when you go to vote in November, do not just keep it to yourself. If nobody in the mainstream media will listen to you, then contact me or someone else in the alternative media. Collectively we need to scream bloody murder if they try to steal this election. And if there is one thing that we know about Donald Trump, it is that he is not afraid to file lawsuits. But the Trump campaign cannot be everywhere, and it is up to ordinary men and women to report any signs of trouble that they see or hear on election day. If we will not fight election fraud, we might as well not even have any elections. Because what is the point of spending so much time and effort trying to get someone elected if we are just going to let them steal the elections from us? Map of Islamic Terrorist Network in U.S.
Let’s see what these immigrants are up to, shall we? “OBAMA AND HOLDER IGNORE MUSLIM “NO GO” ZONES ALREADY OPERATING IN THE U.S.
What makes anyone think Holder or the DOJ is going to do anything to upset the Islamic Apple Cart? We have seen and heard of the Muslim “no go zones” in France (pictured above) and other areas of Europe, but did you know there are Muslim “no go zones” already established in the United States? Now, you may be wondering why no one has contacted the Department of Justice. The DOJ already knows these zones are here, but they have done nothing about them. On January 15, PBS Newshour ran a story that homegrown terrorism worries North American analysts in the US and Canada. Even ABC is covering the threat of homegrown terrorists, saying it is very real. Members of Congress are stating that it is not a matter of if we will have another terrorist attack on our soil, it’s when. Even the DOJ is warning that attacks are coming. Perhaps they have known all along. As we covered in the story we broke about the 22 Jihad training camps in the U.S., there are Muslims of America (MOA) right here on U.S. soil. More accurately they are Jamaat ul-Fuqra, a Pakastan Muslim Brotherhood and al-Qaeda related branch. There are 35 compounds in the United States, 22 of which are confirmed in 9 different states as listed by the Federal Bureau of Investigations (FBI) documents that state they have been concerned about them since 1991. The FBI can not act because the President Obama and the Department of Homeland Security will not classify MOA, with known ties for decades to Jamaat ul-Fuqra, as a Foreign Terrorist Organization despite a mountain of evidence. Even more disturbing, there is evidence that some Homeland Security and law enforcement officials belong to these compounds. Martin Mawyer, president of the Christian Action Network, knows first hand what happens when you try to approach these compounds as a member of the press. They are not the only ones snubbed or attacked. Ironically, members of the press, Christians, and infidels get better treatment and more freedom of the press in the European “no go zones” than the ones established by MOA right here in the land of the First Amendment. In Europe, they allow discussion, and you can walk in and talk to people. It is obviously not suggested to walk into them and carry signs insulting Muhammad. However, approach one of the compounds in the United States with a camera and you will be met by force. If you call them for comment, they refuse to respond. It is not like the violence and the training is not known. In April 2012, Heritage Foundation released information on fifty terrorist plots stemming from MOA since 9/11. They became one of the first organizations to track thwarted terrorist attacks against the United States. When they started tracking the attacks in 2007, there were 19 foiled attacks that year alone. In 2009, Christian Action Network actually got possession of and released a training video from Hancock, New York. MOA sued Christian Action Network over the release of the video and attacked one of their cameramen. The judge subsequently dismissed the lawsuit. Martin Mawyer also released the book Twilight In America. Muslims of America sued again over the release of the book. The lawsuit was dismissed by a federal judge in April, though leaders of MOA have asked the court to reconsider its dismissal. A ruling is expected later this month. Law Enforcement Today chronicled the camps in 2012 and the danger they pose. What Pamela Geller uncovered for WND makes the situation in the compounds a scenario that would have made the 1930’s Chicago Mafia envious. Members have become local law enforcement officers in Texas, New York, and Virginia around these compounds as well as others. Problems with the U.S. immigration system pose addition risks. The Center for Immigration Studies recorded 41.3 million immigrants from July 2010 to July 2013 into the United States. The FBI and DOJ tracks them as best they can, but as seen by the flood of the illegal “children” last year, they will get bus tickets to anywhere in the country and Immigration and Customs Enforcement are not able to track them. For the Muslim immigrants among them, these compounds give them the perfect location to go and train for attacks on the American public. The title of this is what many ask after finding out exactly what the requirements are in order for one to become President. Well, we have several people attempting to follow in Obama’s footsteps; they are running for office even though they do not qualify as being eligible to do so. Firstly, we must remove from office the usurper Obama. Then, we must insist that those not eligible for the office remove themselves from the race. Our forefathers gave direction on how to impeach, and impeachment is the course of action needed, even at this late date. We insist that our representatives remove Obama from office. This has been attempted several times thus far, to no avail. It appears that our representatives are afraid someone might start screaming racist. So what if they do. After all, this impeachment is NOT about ‘race’ or ‘color’. It is about the fact that Obama perjured himself in claiming he was eligible. This fact would make Obama, our usurper President, a citizen of British East Africa Protectorate/Colony of Kenya because that where his father was a citizen at the time of his child being born. It matters not whether he was born there, or Hawaii, nor whether his mother was a US citizen. The citizenship is passed through the father (see previous post). Even if his father had become a US citizen- which there is no evidence of having happened, he would then have only become a naturalized citizen. Our Constitution calls for a Natural born citizen. Period. The two are NOT the same. As such, he MUST be removed from office. NOW. If our representatives are derelict in their duty to do so, then WE must make them do so. Public pressure can make that happen, if we are relentless. We must point out to them that it is their duty, that they have sworn an oath to uphold our Constitution, and if they fail to do so, we shall remove them from office. We have no choice but to do this. It MUST be done. And it goes on to list what then happens with the office of the Vice-Presidency, etc. They have a very short time to get all the bases covered, so that the Executive Offices are not lacking in proper persons to carry on the duties of said offices. If that office, and the next, and next, etc. is temporarily filled with someone who must also go, then we must instruct our representatives who to put in those offices so the country has leadership. If we have to remove our representatives, then we must, post haste, decide who to replace them with. First, we must bring evidence of the Obama taking part in “treason, bribery, or other high crimes and misdemeanors” (United States Constitution) to the House of Representatives, (and we can also notify the Senate). You can notify the Committee on Standards of Official Conduct of this evidence, as well. In the case of removing a Representative, after we notify the committee, it is up to the House of Representatives to investigate and determine if the evidence is sufficient to warrant impeachment. If they decide to proceed, a vote to impeach will be taken, and if a majority agrees that the he should be impeached, the case will go before the Senate for trial. A two-thirds majority vote in the Senate is require for conviction, in which case he will be removed from office. The process is similar for the impeachment of the President. We MUST assure that he does not resign, especially with any conditions granted. For example, ‘well, if you resign, we won’t press charges for all your wrong-doing’. NO! He Must be tried for perjury, and for all his other crimes. The goal is to have him be held accountable for all of it. Once he is found guilty, everything he has passed is moot and void. He MUST be made to pay the American people back for all the money he cost us during the time he was sitting in office, as he was never entitled to any of it to begin with. Every appointment he made , as an usurper, is moot and void, and all actions taken are to be viewed as “they never happened”. We must make sure that he is fully held accountable for all damages he has brought upon the American people. He and his heirs must bear the burden of his usurpation. In this way, we can assure that no one else attempts to follow in his footsteps. At the moment, we have several others running for office that are also not eligible. This MUST STOP NOW. If these contenders see what happens to someone Not Eligible for office, it will go a long way in preventing this usurpation in the future. After impeachment, we must insist that he be tried for his criminal actions, and duly punished. Not in some ‘country club’ prison, either, but a high security prison for those who have committed Treason and other High Crimes- some place like Guatanamo, with NO chance of parole or release. Obviously, we will be taking a loss on what he owes us, temporarily- as his heirs will bear the brunt of the burden for generations to come. But, eventually, our coffers will see some, if not all, of the wasted money returned. They must be ordered to sell everything they have and put the proceeds back into the hands of the People. And all this must be done on the condition that NO future President may be allowed to pardon him for his crimes or reduce his sentence or reduce the amount that needs to be repaid to the People. Anyone who attempts to do so shall be held in Contempt of the People, and just punishment levied upon them. America’s People can no longer be taken advantage of by usurpers. We can not leave this to our younger generations to deal with, as they are, for the most part, lacking in the knowledge of the Supreme Law of the Land; they have little to no working knowledge of our Constitution, and we cannot afford to leave this duty to tender hands. It is up to us to make sure America stands. It is our duty to protect our selves and our future generations. Left untended, this usurpation will be worse than a plague. Many say, ‘There’s no time!’ , or ‘He’s only got a short while before he’s gone'(perhaps, but we will end up continually paying him for his crimes! ), or they claim they are too old, too tired, and now they just ‘choose their battles’, or they plan to leave it to those who follow, since they have grown complacent. NONE OF THESE ARE ACCEPTABLE ‘reasons’- they are NOT! It is our DUTY to deal with this- and deal with this IMMEDIATELY. Do you really want to let his happen to your home? To your children, and grand-children? Do you really want to crush any possibility of freedom? Or do you really want to make sure that you – as a person who is critical part of a SELF-GOVERNING republic- put this country on the track our Forefather’s set out for us? Your role and duty is one where you are instrumental in preserving what we were given to protect- the Freedom to protect our Life, Liberty, and the Pursuit of Happiness. Are you going to let everything completely go down the drain simply because ‘you don’t have time’, or you just don’t care about the rest of your life or the lives of your family, friends, and countrymen? In case you do not know what follows complacency in a nation, it is dictatorship. Is that what you want, truly? Have any of history’s past dictators been kind to the People? No. So get off your rear, get on the phone, get to typing letters, get to going wherever you have to go to in order to be in the face of our Representatives, and get them to do their job. We do not need a 2nd Bloody revolution- we just need to do our duty, and do it well- and we need to do it NOW. Being a self-governing republic has its responsibilities (as well as its perks), and those responsibilities lie squarely on our shoulders. WE, the PEOPLE. The very least we owe our Forefathers and Founding Fathers is to exhibit at least as much backbone as they did for us. We owe it to them, ourselves, and our future generations. This country was founded on much less than we have at our disposal right now. If they managed to make time amongst their overly busy days and nights, surely each one of us can do the same to assure that we maintain/re-gain what was gifted to us, what all our Veterans fought and died to protect, what is really worth saving and protecting. WE are the ONLY ones who are in a position to do this. We cannot afford to leave our duty unattended. There is too much at stake. Our Founding Fathers told us that we must be diligent. We must. We must make the time to assure that we guard this precious gift with all we have. We cannot rely on others to take care of it for us. Only we know what is best for us; only we know how to make sure we always have those rights of liberty, life and happiness. We have been given the tools…let us employ them diligently. This task, this duty takes precedence over all else. If we no longer have our self-governing republic, we have nothing. And you can bet that if we do not have it, something else that we don’t want will replace it! This task is URGENT and we can no longer hope for the best. We MUST ACT NOW. We have already been apathetic and complacent far too long! Do not sit there crying ‘we can’t do anything’- WE can do what our Founding Fathers instructed us to do. We can remove this usurper, and make sure he pays for his criminal acts. Let each of us now tend to our duty, for ourselves, our country and our children. Make time – right now- to begin, and keep at it until we have accomplished our goal. Do NOT give up. Do NOT give in. Just KEEP DOING what needs to be done- Keep making those calls, keep writing those letters, keep informing others, keep helping to get others to do the same, send petitions, go visit our representatives and demand this be done. Do not take No for an answer. Keep going and going and going until we succeed. Public pressure CAN make this happen. Do whatever it takes to get it done. It is our Life we are talking about here. Without safeguarding our liberty, we have nothing. We must handle this just like we handle going to the bathroom- it is just something that needs to be done! No one wants to live in a state of being covered in defecation, and no one wants to have to clean up big messes of it. If we don’t tend to our business when we need to, we end up dealing with the most unpleasant consequences. Best to realize when it is time to take care of business. Right now, we have a very messy situation to clean up, so Let’s Get To It!!! Obama just happened to know 60s far-left radical revolutionary William Ayers, whose father just happened to be Thomas Ayers, who just happened to be a close friend of Obama’s communist mentor Frank Marshall Davis, who just happened to work at the communist-sympathizing Chicago Defender with Vernon Jarrett, who just happened to later become the father-in-law of Iranian-born leftist Valerie Jarrett, who Obama just happened to choose as his closest White House adviser, and who just happened to have been CEO of Habitat Company, which just happened to manage public housing in Chicago, which just happened to get millions of dollars from the Illinois state legislature, and which just happened not to properly maintain the housing — which eventually just happened to require demolition. Obama, Sr. just happened to have his education at the University of Hawaii paid for by the Laubach Literacy Institute, which just happened to have been supported by Elizabeth Mooney Kirk, who just happened to be a friend of Malcolm X, who just happened to have been associated with the Nation of Islam, which was later headed by Louis Farrakhan, who just happens to live very close to Obama’s Chicago mansion, which also just happens to be located very close to the residence of William Ayers and Bernardine Dohrn, who just happen to have been occasional baby-sitters for Malia and Natasha Obama, whose parents just happened to have no concern exposing their daughters to bomb-making communists. Obama also worked on voter registration drives in Chicago in the 1980′s and just happened to work with leftist political groups like the Democratic Socialists of America (DSA) and Socialist International (SI), through which Obama met Carl David son, who just happened to travel to Cuba during the Vietnam War to sabotage the U.S. war effort, and who just happened to be a former member of the SDS and a member of the Committees of Correspondence for Democracy and Socialism, which just happened to sponsor a 2002 anti-war rally at which Obama spoke, and which just happened to have been organized by Marilyn Katz, a former SDS activist and later public relations consultant who just happened to be a long-time friend of Obama’s political hatchet man, David Axelrod. In 2003 Obama and his wife attended a dinner in honor of Rashid Khalidi, who just happened to be a former PLO operative, harsh critic of Israel, and advocate of Palestinian rights, and who Obama claims he does not know, even though the Obama’s just happened to have dined more than once at the home of Khalidi and his wife, Mona, and just happened to have used them as occasional baby-sitters. Obama reportedly praised Khalidi at the decidedly anti-Semitic event, which William Ayers just happened to also attend, and the event Obama pretends he never attended was sponsored by the Arab American Action Network, to which Obama just happened to have funneled cash while serving on the board of the Woods Fund with William Ayers, and one speaker at the dinner remarked that if Palestinians cannot secure a return of their land, Israel “will never see a day of peace,” and entertainment at the dinner included a Muslim children’s dance whose performances just happened to include simulated beheadings with fake swords, and stomping on American, Israeli, and British flags, and Obama allegedly told the audience that “Israel has no God-given right to occupy Palestine” and there has been “genocide against the Palestinian people by (the) Israelis,” and the Los Angeles Times has a videotape of the event but just happens to refuse to make it public. Keep US Out of EU-style Pacific & Atlantic Unions! [The European Union] process was, from the beginning [in 1951], economic in its means and political in its purpose. But the economic means had to work in their own right in order to achieve the political purpose: economic integration would encourage political integration, not the other way around…. The EEC [European Economic Community] was a common market designed, over time, to become a common political space. That finally happened nearly four decades later, in 1992…. It has now become clear to us that what we thought was a Common Market is nothing more than a project to create a European federal super-state in which our sovereignty, Britain’s national identity, would be extinguished. On June 18 the House voted 218-208 on final passage of Trade Promotion Authority (TPA). Then, on June 24 the Senate voted 60-38 on final passage of TPA and sent it to the president’s desk where it was signed into law on June 29. Now that TPA has been approved by Congress, the fight moves on to stopping the Trans-Pacific Partnership (TPP) and Transatlantic Trade and Investment Partnership (TTIP) agreements. The main reason why it is going to be so hard to stop congressional approval of these agreements is that there is such widespread collaboration in a cover-up of the real purpose of these agreements. To understand the purpose, please read carefully the two quotes above. Yes, the first quote is fairly long and opaque; however, here’s a translation for you: The European Union process was, from its beginning in 1951, promoted as being about the economic integration of the nations of Europe, when in fact its purpose was always the political integration of the nations of Europe. However, this real purpose of political integration was covered up so well that Bernard Connolly (see his quote above), an employee of the European Commission (the executive body of the European Union) in the 1990s, could state that although he originally thought the European Union process was only about economic integration (a Common Market), he now saw in 1996 that it was all about political integration leading to the creation of a European federal super-state in which all of the member-states’ sovereignty’s would be extinguished. Here’s what the above means. To help ensure success, the EU was sold as a series of agreements concerning economic integration, even while its planners were committed to political integration from the beginning. Now many of the same internationalist organizations that helped plan and build the EU are selling two new partnership agreements, the TPP and TTIP, as if they are only concerned with economic integration, when in reality their purpose is political integration. This constitutes a “trade mergers cover-up”! 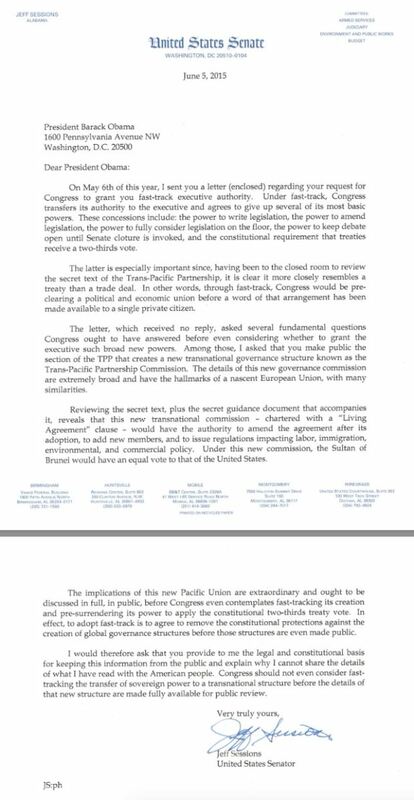 [In a letter dated May 6] I asked that you make public the section of the TPP that creates a new transnational governance structure known as the Trans-Pacific Partnership Commission. The details of this new governance commission are extremely broad and have the hallmarks of a nascent European Union, with many similarities. Reviewing the secret text, plus the secret guidance document that accompanies it, reveals that this new transnational commission – chartered with a “Living Agreement” clause – would have the authority to amend the agreement after its adoption, to add new members, and to issue regulations impacting labor, immigration, environmental, and commercial policy. Under this new commission, the Sultan of Brunei would have an equal vote to that of the United States. The implications of this new Pacific Union are extraordinary and ought to be discussed in full, in public…. So, how can you tell whether your congressmen are participating (consciously or not) in a trade mergers cover-up? Easy. When you contact them in opposition to the TPP and TTIP agreements, do they justify supporting them in economic terms, such as more jobs, more prosperity, better economy, etc., and never mention the downsides of the loss of national independence? Do they ignore or reject Senator Sessions’ revelations about the EU-style Pacific Union that would be created by the TPP agreement? If this describes your congressmen’s answers, then they are participating in a trade mergers cover-up. Most Republicans and many Democrats in Congress are participants. If your congressmen are participating in the cover-up, you need to make them aware of the dangerous deception that they are involved in and help them to understand what the planners behind the TPP and TTIP trade mergers are up to. Probably the two best articles to bring them up to speed are: “Global Merger Piece by Piece” and “The EU: Regionalization Trumps Sovereignty.” These articles are available online at TheNewAmerican.com and also as part of the TNA Special Report: How the Free Trade Agenda Is Knocking Down America. Only a Few Months Left to Save American Independence! The Obama administration is striving to finish up negotiations and to present a final TPP agreeement to Congress before the end of 2015. Under the provisions of the recently passed TPA bill, each house of Congress will be forced to vote on the TPP agreement within 45 days after the agreement is introduced in that house. Debate is limited to 20 hours. No amendments are allowed in either house. No filibusters are allowed in the Senate, which means only a simple majority is needed for passage in each house. Click here to see how your representative voted on Trade Promotion Authority (TPA). Don’t be confused by the official descriptions; this was the final House TPA vote. A yes vote is a good indication that he or she will vote for TPP and TTIP. Click here to see how your senators voted on TPA (This was the final Senate vote on TPA). Please also scroll down to email your representative and senators in opposition to the TPP and the TTIP trade partnerships. WE MUST STOP this TPP NOW!!! Remember- WE did not need any outside entity in order to create jobs when our country was founded. WE did it. WE can do it again!! It was not the ‘help’ of an unelected body that lead us to our position of being a world leader- it was through our own efforts. We must not give up our sovereignty and freedom on a deceptive promise of ‘jobs’. This TPP is NOT about trade- it IS about outside control! URGENT, URGENT ACTION NEEDED NOW. PLEASE FOLLOW THE SCRIPT AND DIRECTIONS BELOW. OUR EFFORTS ARE PAYING OFF AND MAKING THESE CALL NOW IS IMPERATIVE. YOU HEARD BOEHNER IS RESIGNING. THERE IS A REASON HE IS STEPPING DOWN AT THIS POINT, JUST 1 YEAR BEFORE THE ELECTIONS, AND WE NEED TO DO THIS SIMPLE TASK BELOW TO PUSH OUR EFFORTS FORWARD. THESE WILL BE THE TWO MOST IMPORTANT PHONE CALLS OF YOUR LIFE, AND THE LIFE OF YOUR CHILDREN, GRANDCHILDREN, AND OUR COUNTRY. URGENT, URGENT Request. We MUST call Rep. Louie Gohmert (202-225-3035) and Rep. Scott DesJarlais (202-225-6831) and deliver a simple message to them. This is it folks. MAKE THE CALLS and get everyone you know to make the calls. Even if you have already called, CALL AGAIN. SHARE, SHARE, AND SHARE AGAIN. CALL, CALL, CALL, AND CALL AGAIN!!! THERE ARE 500 MEMBERS ON THIS WEBSITE. IF EVERYONE OF YOU MADE THESE TWO PHONE CALLS AND SHARED THIS MESSAGE WITH EVERYONE YOU KNOW, THIS GROUP ALONE COULD PUSH THIS EFFORT FORWARD. Please take a few minutes to watch the 2 short videos below. Thank you for registering with the Constitutional Accountability Coalition of Tennessee. The above email is Copyright © 2015 Constitutional Accountability Coalition of Tennessee, All rights reserved. WHY would anyone make such a deal? Must be they want to see the total destruction of America. Is that what he meant when he claimed he was going to change the U.S.? And what about our men being held hostage there? Obama is just writing them off??!! There’s something very, very wrong about just leaving them there at the ‘mercy’ of their captors! We all know what will happen to them. How could such a deal ever be struck? It also makes one wonder who’ll be first on their list…Israel or the U.S. Seems it fits impeachable crimes, as it clearly is aiding and abetting an enemy of the U.S.
Add to that the recent change in the swearing in of new citizens- they no longer have to pledge to defend America if it goes against their religion or conscience. Do you have any idea of how many millions of Muslims have come here since Obama has been in office? Whose side do you think they will fight on should we get into having to defend ourselves from a Middle East adversary? Please write to your reps and demand impeachment- before we do not have a country at all.